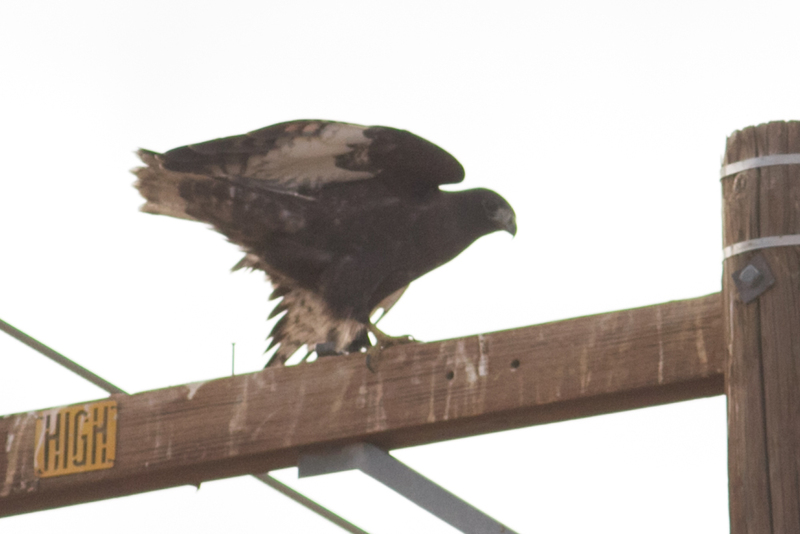 Red-tailed Hawk – Harlan’s or Dark Western? Yesterday (October 22 2013) I spent some time out in the Antelope Valley near Los Angeles doing some birding with friends. Whilst out there we stumbled on this incredibly dark Red-tailed Hawk. So the big question in my mind was is this a Harlan’s or not. I’ve done some background reading on Harlan’s Hawk but it often seems somewhat amorphous as to what you are looking for to clinch the ID. That said tail and barring through the primaries looks promising? The bird was at least initially pegged as a dark western bird, and at least a couple of observers thought they saw a hint of rufous in the tail – but it is certainly not evident in the pictures. I think we all agreed it was about the darkest individual we had ever seen if it was just a western type bird; being almost completely black. 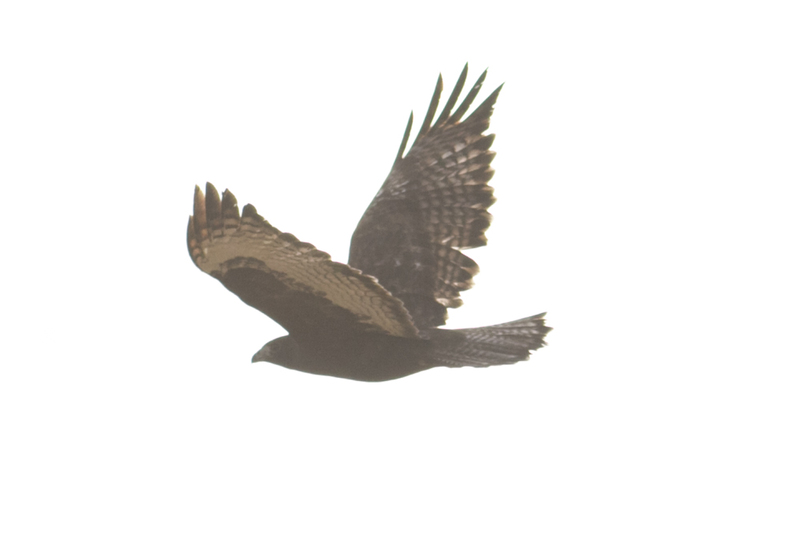 The above photo of the upper tail shows how dark it looked perched. 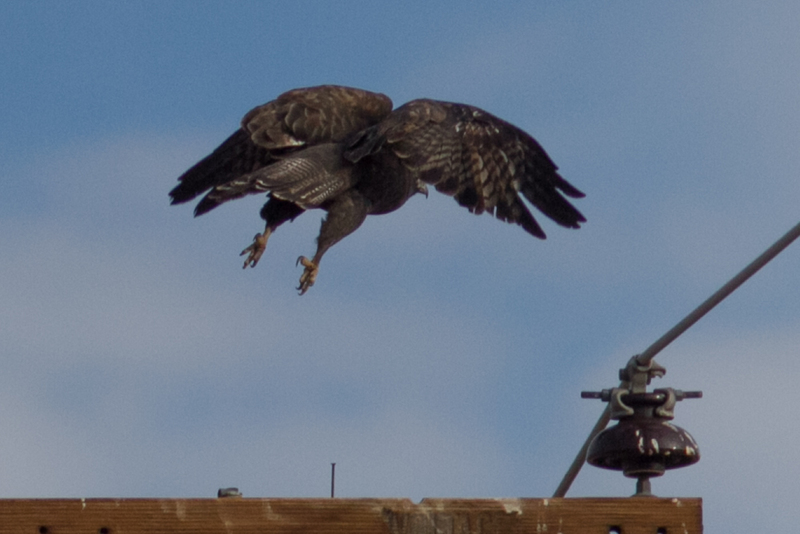 The above shot gives you a better view of the undertail and underwing markings. Obviously these shots were taken in extremely low light conditions pretty much right at dawn. Not really done much with them in processing – just a little cropping really. Whatever it is as far as subspecies is concerned I think it’s an incredibly cool looking bird. Just wondering what others thought, so any thoughts certainly appreciated. Probably the best resources online with regard to this discussion are all published by the American Birding Association: William S. Clark’s article on Harlan’s Tail Variation (here), Liguori and Sullivan’s article on Western and Eastern Red-tailed Hawk vs Harlan’s (here) and the Liguori article from the same publication on Dark Red-tails (here). 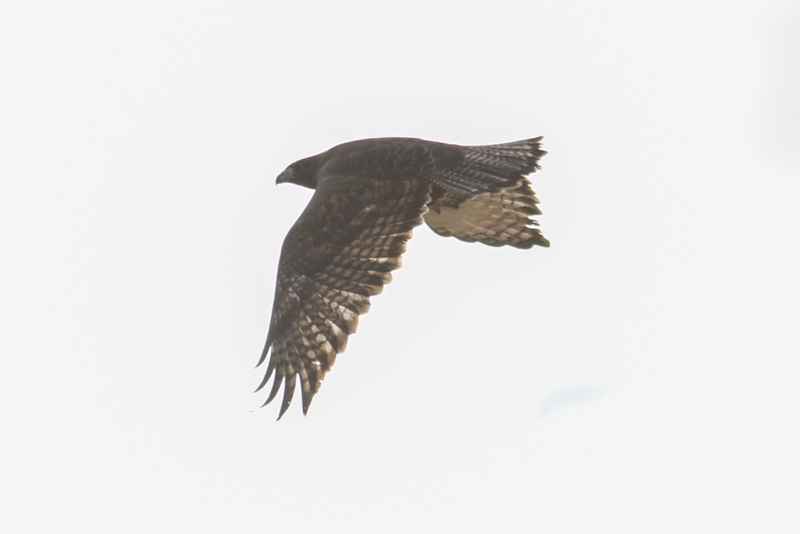 EDIT: All of the authors of the above articles have seen pictures of this bird and are happy that it is a Harlan’s Hawk.